The historic landscape area of Rhossili Bay is delineated by the mean low and mean high tide watermarks as shown on 1:10000 OS map. Activity in the area dates back to the Palaeolithic with the discovery of a flint hand axe (01014w) on the edge of the beach having being eroded naturally from the cliff face. This is a small plano-convex pointed ovate handaxe of unstained flint, patinated white and represents one of only two stray Palaeolithic axe finds in Wales. 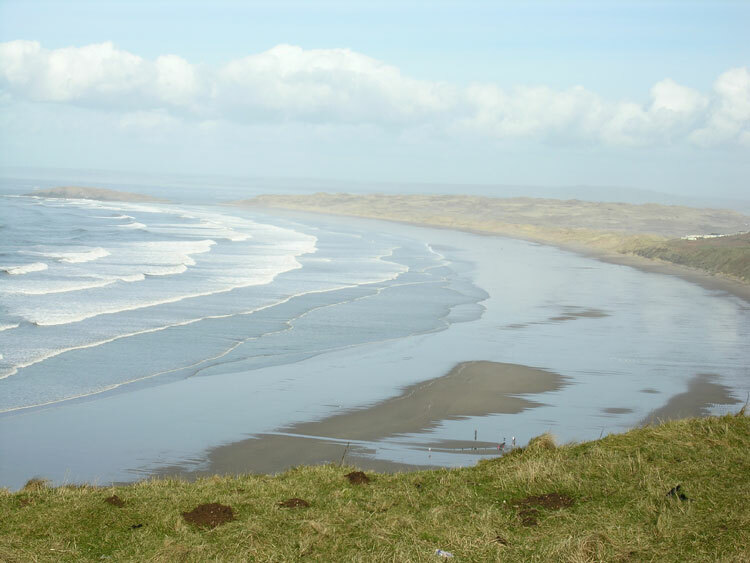 Although no evidence direct from Rhossili beach has been uncovered it is likely that this area was utilised throughout prehistory in a similar way to other coastal areas of the Gower. The only other possible pre-medieval find the reported discovery of a midden of Roman date, however, little detail is known. The Gower coast has strong maritime connections and a number of legends associated with seafaring, smuggling and piracy. Documentary evidence records that raiders destroyed Llangennith Priory in 986 AD. Folk memory adds other details, which place the landing of Viking ships in the bay; suggesting that the people of Rhossili burnt these ships in reprisal (Edmunds 1979). The infamous 'Dollar Ship' was wrecked here in the seventeenth century. Spanish silver dollars depicting Phillip IV dated to 1625 and 1639 were recovered from the wreck over a hundred years later in 1807. It is reported that further finds were made throughout the years, the last being in 1833. Other known ship wrecks in the bay include; City of Bristol 1840 (03037w; 385), Tocopilla 1878 Mary Stenhouse 1879, Verani 1894, Ann of Bridgewater 1899, Notre Dame de Lourdes 1910, Pansy 161 1941, Cleveland 1957. Remains of Helvetia (03024w; 464) wrecked in 1887 and of Vennerne (03023w) wrecked in 1894, can still be seen in Rhossili Bay. The wreckers of Rhossili may have been responsible for some of these disasters as the booty gained from shipwrecks was a great 'prize'. False lanterns set along the coast lured ships to their fate. It is said Rhossili Bay was ideal for smugglers due to its remote location; one well known smuggler was William Stote, Innkeeper of Middleton, who imprisoned a customs officer in his stable. Contraband was hidden all over western Gower and it is even reported that especially dug cellars were located on Rhossili Down (Lucas 2004). Customs investigations were common and on one occasion 101 casks of brandy, rum and wine were left on Rhossili beach (Lucas 2004, 28). The coastal trade in limestone is well documented for the area. The majority of limestone quarried on the south coast of Gower would have been shipped off to Devon, where the limestone could be shipped in cheaper than it could be obtained locally. Although limestone could have been shipped to Devon from Rhossili Bay, Lewis in his topographical dictionary of Wales (1833) describes 'great quantities are shipped from the bay to different parts of the principality'. The last limestone boats left Rhossili in 1899, the industry being killed off by the advent of rail transport.